The cover for Doctor Who Magazine issue 406 has now been released and as you can see it features David dressed to impress for Comic Relief. Inside the issue he will be talking about what we can expect on the night as he will be kicking off proceedings by presenting the first hour of the show with Davina McCall. Doctor Who Magazine issue 406 will be released on Thursday, the 5th of March at the RRP of £3.99. David has been in Newport filming for the next, as yet untitled, Doctor Who special. Thanks to Matthew Robinson we have some photos from last night's filming here. Headway Essex would like to thank all of you who donated to their appeal by purchasing a card signed by David. Your support will help people living with brain injuries and their families and carers. They are delighted with the success of the campaign and have raised a brilliant £38,000! All cards have now been sold, but there will be details of a new campaign on the site in the future! As we previously told you last month, David has recently narrated TV and radio adverts for a new album for the War Child charity. Released by EMI through its Parlophone label, the album sees some of the biggest names in music history select one of their personal favourite songs from their own back catalogue, and nominate a musician from the next generation to create a modern reworking of it. Tracks include a version of Paul McCartney's "Live and Let Die" sung by Duffy, Franz Ferdinand's version of Blondie's "Call Me", and a cover of U2's "Running to Stand Still" by Elbow. The album was released on February 16, and all profits made will go towards helping protect children caught in the conflict of war. "We chatted on the phone not long ago and we did exchange a few opinions on what’s about to unfold for him, but advice is a very dangerous thing. Matt’s got an extraordinary journey coming up in all sorts of ways and I’m sure he’ll find his own way through it. I could tell Matt was very up for it, though, and excited in all the right ways. He says he’s going to take it very seriously and he seems to have the right idea about playing The Doctor, so far as I can tell." The latest issue of What's On TV is out now. Get A Signed Card From David - Less Than 100 Left! There are now less than 100 Headway cards signed by David available so if you still haven't got yours you need to do it today as they will soon be gone! Don't forget that as well as getting yourself a gorgeous glossy card signed by David himself you will also be helping a fabulous charity continue the wonderful work that they do! There have been several recent cases of people posing as David Tennant and other members of the Doctor Who cast in Internet chat rooms and forums - as well as setting up social networking profiles in their names. So fans are not disappointed or misled, we'd like to point out that both David Tennant and incoming Eleventh Doctor Matt Smith do not use social networking websites, chatrooms or forums. They wouldn't want fans to think that anyone who uses these are talking to the real actors. For their own safety, we would strongly advise all Doctor Who fans to ignore any such postings and not be fooled by these impersonators - it will never be David Tennant or Matt Smith online. David's return to the stage as Hamlet was named theatre event of the year in the ninth annual Whatsonstage.com Theatregoers' Choice Awards. The play, which was in residence at the Courtyard Theatre in Stratford-upon-Avon, was also named best regional production. The awards are voted for by the public with some 35,000 people casting their vote. Full details of all the winners are available on the whatsonstage.com website here. The BBC has confirmed that part of the forthcoming Doctor Who Easter special will be filmed in Dubai. Planet of the Dead, which stars David Tennant as the Doctor alongside Michelle Ryan and Lee Evans, began filming in January in Cardiff and the team are now descending upon the Arabian Gulf to film further scenes for the episode. "We rarely take Doctor Who abroad," said Doctor Who Producer Tracie Simpson. "We did visit Rome for Series Four's The Fires of Pompeii - which gave us some spectacular footage. The locations in Dubai are a perfect match for writer Russell T Davies's vision of the episode and we expect to film some incredible scenes while we are here." The winner of our Quatermass Experiment competition has now been chosen and notified, many thanks to all of you who entered. If you weren't luck enough to be our winner you can still book seats for the screening from the BFI website here. Make sure you visit www.rednoseday.com today to find out all you need to know about Red Nose Day and what's happening on 13th March! You can also sign up to the backstage area and donate! The Shakespeare Birthplace Trust has picked a dozen Shakespearean heroes – including actors, directors and writers – whose images will line the walls of their new Shakespeare exhibition. But they want the public to choose the thirteenth and this is where you come in as David has made their shortlist and with your help could be number thirteen. The Guardian website are currently running a poll to see who the public would like to see in the Hall Of Fame and you can vote over the next week. Click here to cast your vote for David now. If you missed Comic Relief: The Fools' Guide on BBC One last night you can now watch it via BBC iPlayer here. David reads a number of Shakespeare's sonnets on the new audio collection From Shakespeare - with love. The edition contains 75 of Shakespeare’s finest sonnets and is released to coincide with the 400th anniversary of their first publication in 1609. It is read by a whole host of leading actors including Juliet Stevenson and Anton Lesser. Don't forget that David-Tennant.com is now on Twitter so you can get quick updates straight to your mobile! The Radio Times has released more photos of David from when he attended their Covers' party last month. Click here to view the full set. David is also featured in the coverage of the party in the latest issue of the Radio Times which is out now. Don't forget to tune into BBC One at 22:35pm tonight as David will be narrating Comic Relief: The Fools' Guide..
Members of the BFI can download David's short film Sweetnightgoodheart throughout February. Click here for more details about becoming a member. BBC Three will be starting a repeat run of series 2 of Doctor Who from tonight. New Earth kicks it all off at 19:00pm. The BFI have kindly given us two tickets to The Quatermass Experiment screening on Tuesday 10th February at BFI Southbank and they could be yours! What was the name of David's character in The Quatermass Experiment? The competition closes at 12pm on Thursday 5th February and we will contact the winner by 12pm on Friday 6th February. 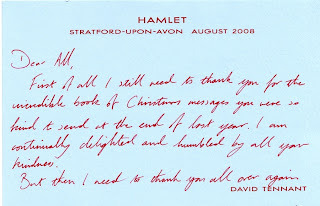 David has very kindly sent a thank you note for all of you who wrote him messages for the Christmas Book and left get well soon messages for him... you can read the note above.